Spring is on the way, and communities all over Virginia are welcoming it with outdoor athletic events. From 5Ks to marathons, every athlete can find something to participate in over the next several months. This June, Radford, a Designated Virginia Main Street Community, will be hosting one of the most unique events Virginia has to offer—the Bike Virginia Tour. Bike Virginia is an annual group bike ride involving 2,000 cyclists. The event began 24 years ago, with cyclists touring a different part of the commonwealth each year. Over five days, participants average 50 scenic miles, visiting host communities and taking in the views. 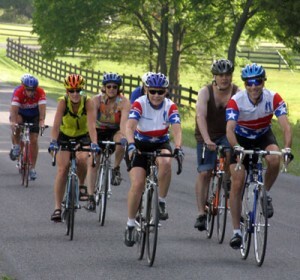 The 2011 Bike Virginia Tour will take riders throughout the New River Valley. Participants will see breathtaking scenery, ride on the famous National Bike Route 76, and camp on the banks of the New River. During their time in Radford, riders will have the opportunity to visit Bissett Park, where the community will provide an evening of entertainment. Additionally, riders will dine in downtown Radford and will be given time to explore the local shops. Registration for the Bike Virginia Tour is now open. The tour runs from June 24-June 28, and will be in Radford from June 26-June 28. For more information, please visit the tour’s Web site at www.bikevirginia.org/.